Despite the popularity of music streaming services like iTunes and Spotify, many college campuses still operate thriving independent radio stations. Beyond playing music, college radio stations serve as cultural unifiers, connecting students through music and news. College radio stations also bridge the gap between schools and communities, providing college students with information about local news and events while informing communities about campus happenings. While some stations are only available through online streaming, the best college radio stations also broadcast through traditional AM/FM channels. Some broadcast 24 hours a day, seven days a week, all year long. 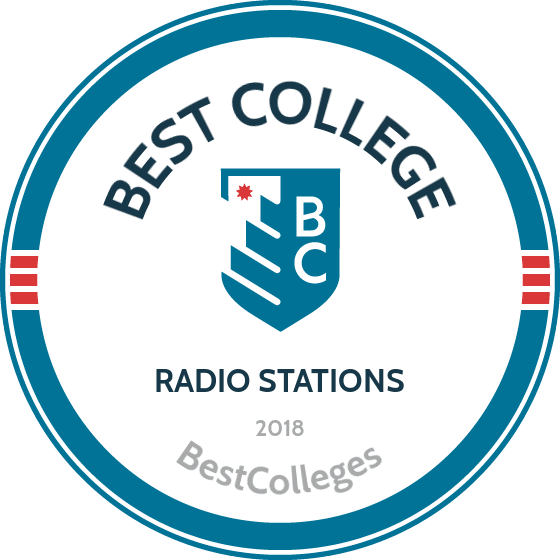 The best college radio stations also serve as an educational platform for students interested in radio broadcasting, communications, or sound engineering. Student volunteers learn about FCC regulations and general radio station operations while gaining skills in areas such as programming, marketing, event planning, budgeting, production, and graphic design. Student DJs curate and host their own shows, increasing the diversity of programming to appeal to a wide audience. Here's our list of the 20 colleges with the best radio stations. These stations create interesting, relevant, and fun programs while offering students practical experience in broadcasting. The best stations offer a variety of programs, including news, music, sports, and talk shows. They also design programs to achieve an intentional goal, such as to be eclectic, socially engaged, or local. While some stations are entirely student-run, others recruit community members to enhance their offerings and provide the best programming. Stations on this list are known for their outreach within the institutional community and beyond. Many of the stations listed operate from professional, modern studios that not only provide great listening, but also serve as laboratories for teaching students about radio broadcasting and engineering. The Lawrence Herbert School of Communication at Hofstra produces WRHU-FM, the school's award-winning radio station. In 2017, the station received the National Association of Broadcasters Marconi Award for non-commercial station of the year. WRHU also earned a Marconi award in 2014, making it the first non-commercial station to receive two Marconi awards. In addition to a variety of music programs, including opera of the week, Celtic country, and aggressive edge, the station regularly airs news stories, sports broadcasting, and even a game show. WRHU also serves as an educational platform for students interested in radio and radio broadcasting, making Hofstra a compelling choice for those interested in broadcasting careers. Each year, nearly 270 students work on the station and gain valuable broadcasting experience. Before participating, students must complete a two-and-a-half-month introductory course that covers topics including announcing, audio engineering, audio production, programming strategies, and FCC rules. Founded in 1948, St. Bonaventure University's radio station, The Buzz (WSBY-FM), plays an eclectic mix of music every day, including a steady flow of new releases. Eighteen students form the station's board of directors, and more than 200 students volunteer their time, making the station a student-run endeavor. In addition to music, the station broadcasts news and sports and promotes events on campus and around town. The station also publishes an entertainment and music magazine called Buzzworthy, which boasts its own editorial staff and student contributors. The station's podcast features specialty shows and interviews. A system called Live365 broadcasts the station online at all hours, allowing alumni who no longer live near the school to listen to their alma mater's station. WSBY takes requests from listeners on campus and around the world and has received requests from listeners on all seven continents. Each week, more than 200,000 listeners around the world tune in to KEXP-FM, a station serving University of Washington students and Seattle residents. The station boasts a consistent stream of underground songs and unique public affairs commentary. More than 45 expert DJs bring listeners emerging and local artists alongside a complementary program of local and national news, political commentary, sports coverage, and specialty shows produced in house. Local shows cover public affairs, the Pacific Northwest, blues, country, roots, electronic, hip-hop, jazz, rock, and world music. The station is active online, offering a YouTube channel, a blog featuring reviews and artist spotlights, and a podcast featuring recordings of live performances and playlists tailored to runners. The station frequently hosts in-studio performances by local and national artists. Listeners unable to tune in to the FM broadcasts can stream the station online, connecting current students, alumni, and music fans around the world. As the independent radio station of UC-Berkeley, KALX-FM serves the institution's student body and the surrounding Bay Area. A large crew of volunteers, comprising students and community members, runs the station. Volunteers work at least 12 hours a month; after three months, volunteers begin DJ training and can eventually land their own show. KALX began broadcasting in 1962, and today, provides a diverse mix of music, public affairs programming, public service announcements, news, and community information. Each year, the station's DJs compile a "best of" list showcasing their favorite songs and albums released that year. The station plays the list for seven days, helping listeners discover new music and connect with each DJ's aesthetic. In addition to a frequently updated website, the station maintains active social media accounts. Listeners unable to tune in from the Bay Area can listen to the station's latest programming through its online listening page. KUPS-FM serves student listeners at the University of Puget Sound and in the greater Tacoma area. The student-operated station broadcasts 24 hours a day, seven days a week and streams live online for alumni and students who are away from campus. In addition to exploring new artists and experimental sounds, the station plays a variety of genres, including jazz, blues, hip-hop, death metal, psychedelic rock, afrobeat, folk, house, and indie rock. The station also serves students interested in communication and broadcast. Any enrolled student can apply to become a DJ. Because positions are competitive, students can also apply to be an alternate DJ and fill in when necessary. The station's Street Team heads marketing efforts, selling merchandise and garnering support for the station through fundraising, promotions, tabling, and a zine published each semester. KCSB-FM, the radio station at UC-Santa Barbara, broadcasts unique, controversial, and stimulating material. The station's news programming focuses on fringe perspectives in local and international news. Its music and cultural arts programming represent traditional forms and experimental work from the Santa Barbara community and beyond. Programming runs 24/7, and the station offers a free, live webcast that students and alumni can stream from afar. All specialty programs are student produced and include popular shows such as Motown Beat, Culture of Protest, And Sonic Earscape. Students learn about radio broadcasting under the supervision of trained audio professionals. Aspiring DJs hone their skills in the station before starting their own show. The Capstone (WVUA) radio calls itself the voice of the University of Alabama. The station provides 24/7 programming and an online listening platform. While the station plays a variety of genres, it emphasizes local music, particularly artists from the Tuscaloosa area. The station plays mainly alternative rock during the day, and specialty shows in the evening cover any and every genre. In addition to music, the station airs coverage of the university's many sports matches. Founded in 1940, WVUA is one of the oldest college stations in the country. It was originally created to provide broadcasting experience to students interested in radio. Today, nearly 100 student volunteers take part in programming each semester, from within the school's College of Communications and other colleges. Volunteers learn about programming, budgeting, community service, and personnel management. Founded in 1968, WREK is an integral part of the student experience at Georgia Tech. The station, which is broadcasted from the GT Student Center in Atlanta, is managed, operated, and engineered by students, for students. The station's diverse music selections include atmospherics, blues, synthesizer, and zydeco. Students and alumni can also listen online and browse a two-week program archive. Those who want to host an event can rent DJs and sound equipment for an affordable hourly fee. WREK hosts nearly 50 hours per week of specialty shows, in addition to syndicated programming, public affairs broadcasts, and sports coverage. Freakers Ball explores vinyl music from the late 1960s, while Battleground offers a condensed recap of the week's most pressing news events. Each Tuesday, local musicians gather in the studio for a live performance called Live at WREK; these live sessions are also available on the station's YouTube channel. Cal Poly's radio station, KCPR, began as a student project in 1968. Today, the FM radio station offers 24-hour programming for CPSU's student body and the surrounding community. The station is known on campus as Cal Poly Radio. Weird Al Yankovic began his music career at the station, volunteering as a DJ while a student at the university. The station's multifaceted website offers live streaming, videos of live performances, content about music and culture, and interviews with artists. The bulk of the station's music programming comprises staple shows such as Breakfast Club, Afternoon Delight, and The Comedown. KCPR is student run and caters to student listeners, despite having an audience in the larger San Luis Obispo community. Each year, the station teaches new staff members about music journalism, broadcast, production, marketing, graphic design, events, and videography. Volunteers take a two-credit class in which they learn about recording shows, FCC rules, and creating sound bites. Florida International University is home to The Roar (WRGP), a student-driven radio station that broadcasts to the school's large student population on three signals: 88.1, 95.3, and 96.9 FM. The station provides 24/7 programming to the greater Miami area. The studio is located in the Graham Center at the school's University Park Campus in Miami. Established in 1988, the station is committed to raising the profiles of independent artists from all musical backgrounds. The station dedicates each evening to an individual style of music, and DJs can choose their own songs. The station also carries a variety of news and sports-related programming. The station is only one part of the school's media program, which comprises a newspaper, a magazine, and a press. Together, these platforms comprise a cohesive cultural outlet that provides opportunities for student involvement. KJACK was first broadcasted from a broom closet in 1994, but is now NAU's fully-operational, student-led radio station specializing in local artists and new tunes. The station operates under the School of Communications. In addition to providing quality radio entertainment, the station provides opportunities for students to gain hands-on experience in radio broadcasting. The station is also popular with local Flagstaff residents. The station encourages students to create their own shows and unique programs, resulting in a robust selection of weekly music, talk, and sports segments. The station covers campus sports and area high school games, appealing to the greater community of listeners. Popular programs include Fem Cult, a talk show featuring exclusively female artists, and The Jerk, a sports-centered talk show. WMVL at Manhattan College in Purchase, New York, keeps students and the larger community updated on new and popular music. Known also as The Pulse, the station does not operate an AM or FM channel, instead broadcasting completely online. The online station plays a range of genres and styles, promotes local musicians. WMVL also hosts events, including open mic nights and an annual local music fest with area talent. The station offers an open-door lounge where students can hang out, browse the station's CD library, and download music onto their personal computers. In addition to online streaming, the station's website features a blog called Picks of the Week, on which board members share their favorite new albums. Programming is diverse, and shows include Hip-Hop Hermits, Bohemian Ambition, and Snapple Facts. The Doobie (WDUB) is Denison University's student-run radio station. Nearly 100 DJs broadcast through the station and its online stream, reaching local audiences and listeners around the world. The station was founded in the 1950s as an AM station that played "The Star-Spangled Banner" early each morning. Today, the station features 24/7 broadcasting and offers listeners a variety of sounds and tastes though its DJ-curated shows. Scheduled programs feature a mix of genres and include The Electric Boogaloo, Space Jams, and Let's Get Weird. The station's website offers a blog featuring interviews, reviews, artist spotlights, opinion pieces, and podcast overviews. In conjunction with the school's University Programming Council, the station hosts an annual festival called Doobie Palooza. The event, which began as a casual, student-run festival, is now a yearly blowout featuring student performers and big-name headliners. Emerson College's radio station, WERS, is professionally managed but student-run. Founded in 1949, the station is commercial-free and was the first of its kind in New England. The station strives to play the best and newest local music, as well as obscure classics, and to create new leaders in the media industry. The station relies on a large volunteer base of Emerson students, students from area schools, and members of the Boston community. The station explores 20 musical styles to help listeners discover new tunes. Along with music, the station offers family-friendly weekend shows, artist interviews, news segments, spiritual programs, news segments, and an award-winning show about public affairs called You Are Here. The station features more live music performances than any station in the Boston area and offers online streaming, a dynamic blog, and a host of listener contests. Known as "the voice of Florida State," WVFS is a student-led station affiliated with FSU's Student Government Association and the College of Communication and Information. The station broadcasts 24/7, through 89.7 FM and internet audio streaming. The station provides a blend of new and classic music, news, sports, and entertainment relevant to the student body and the greater Tallahassee community. In addition to popular hits, the station highlights genres that don't receive as much attention on the airwaves, such as experimental, reggae, blues, metal, club, and local music. Regular programs include Solamente Latino, Metal Madness, and Vibes House Reggae Jam. The station also trains students in radio broadcasting and communication. The volunteer staff comprises 150 to 200 students and community members, who receive practical experience in broadcasting. The station also serves the community through its in-house recording studio, where artists can record their work for an hourly rate. Portland State's student-run, exclusively-online radio station, KPSU, functions as an artistic bridge between PSU and the community, bringing the culture of the school to Portland listeners and vice versa. The station gives its DJs complete autonomy, allowing them to create their own unique shows, resulting in a diverse, freeform aesthetic. Most DJs use their shows as a way to introduce listeners to a counter-culture not accessible through traditional radio, as well as new and emerging artists in the Portland area and beyond. The volunteer-run station maintains a staff of about 65 people, most of whom are students. Regular programs include Jazz Generations; All the Singles, Ladies; and Metal for Breakfast. In addition to regular broadcasts, the station curates a blog and a podcast featuring interviews, opinion pieces, and live performances. Radio DePaul is DePaul University's award-winning radio station. The station is housed under the College of Communications and strives to serve as a training ground for students majoring in communications-related areas. The station provides quality, innovate music and non-music programming while also promoting campus events and activities. The station's eclectic music selection includes alternative, classic, folk, and pop. The station features programs like including Broadway Broadcast, The Sounds of Cinema, Your Mom's Mixtape, and British Invasion. Radio DePaul also holds a number of awards. In 2017, it earned three grand-prize distinctions from the Intercollegiate Broadcasting System: best online station, best on-air giveaway, and best news feature. In previous years, the station received recognition for its podcasts, talk shows, PSAs, production packages, and live sports coverage. WUPX, known as "the pulse of the U.P.," has operated on NMU's campus for more than 45 years, serving the university and nearby communities. More than 100 volunteer student DJs participate in programming each semester, resulting in a vibrant weekly schedule of music, news, sports reports, and in-house shows. The large base of volunteers and regular staff members make the station one of the largest volunteer organizations on campus. The station broadcasts 24/7 and is known for providing a wide spectrum of music, including songs by Guns N' Roses, Bob Dylan, Rush, and Frank Zappa. The station hosts concerts and benefits throughout the year and features regular call-in and discussion shows. The station broadcasts from NMU's University Center and is currently developing an automated system that will allow broadcasting to continue during breaks and holidays. KJHK, the student-run radio station at the University of Kansas, broadcasts 24/7. Online streaming brings quality programming to listeners in the Lawrence community and around the world. The station has served as the voice of the Lawrence community and KU since 1975, regularly broadcasting shows such as Breakfast for Beat Lovers, Jazz in the Morning, and Hip Hop Hype. To showcase local and visiting talent, the station hosts regular in-studio performances and co-hosts an annual battle of the bands called the Farmer's Ball. The station relies on 150 student volunteers, including DJs and volunteers in departments including arts and culture, content, music, production, sports, street team, and live music. Student volunteers learn about video and audio production, promotions, music writing, news and sports reporting, content creation, and event planning. KUGS provides diverse musical and public affairs programming, to Western students and the Bellingham community. Broadcasting through 89.3 FM and an online streaming service, the station provides general programming during the day and specialty shows during evening hours. Popular shows include The Get Up Get Down and The Global Market. The station strives to encourage a greater understanding of human differences and cultural pluralism. To this end, the station features a number of National Public Radio programs, such as Democracy Now and This American Life. The station is governed by the Associated Students of Western Washington University and is managed by a staff of volunteer student DJs and programmers. Volunteers learn skills related to hosting a radio show, radio operation, and public affairs. The best college radio stations are ranked according to following factors: 1. The quality, diversity, and intention of programming: The best stations offer a variety of programs, including news, music, sports, and talk shows. They also design programs to achieve an intentional goal, such as to be eclectic, socially engaged, or local. 2. The degree of support and approval, both on-campus and in the community: While some stations are entirely student-run, others recruit community members to enhance their offerings and provide the best programming. Stations on this list are known for their outreach within the institutional community and beyond. 3. Learning opportunities available to students: Many of the stations listed operate from professional, modern studios that not only provide great listening, but also serve as laboratories for teaching students about radio broadcasting and engineering.